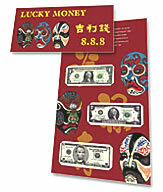 The U.S. Bureau of Engraving and Printing (BEP) on Wednesday launched its "Lucky Money 8.8.8 Set," the latest addition to its "Lucky Money Collection." The number "8" is traditionally associated with success, wealth and prosperity in Asian cultures. The date only occurs once every 100 years. The BEP indicates the 25 limit will be lifted after December 9, if sets remain. When will 2011 lucky money year of the rabbit be released for sale? Lynnn and Pat, the BEP released them on Wednesday, December 15.